Once I got down the whole feeding-changing-napping aspect of taking care of Baby Buckshot, like most moms, I worried that I wasn't doing enough to prevent my baby's brain from turning to mush. I looked into brain stimulating exercises for BB early on and picked up a few books like Baby Play (Gymboree) and Baby Minds and checked out a lot of the online resources. Now, it really doesn't take these books or research to figure out how to stimulate a baby. Age old games like peek-a-boo, the natural way people speak in high pitch voices, the urge to turn on some music to dance with baby, all of these stimulate babies in the way that help them develop their brains to lay a foundation for the rest of their skills. Most people instinctively know how to play with babies. But for nerds like me, here's the rundown. Babies from birth to 3 months are born with only the basic skill they need to survive. Suckling to stay fed, breathing, urinating and voiding and crying to get someone else to do everything they don't know they need. (Actually, they don't really know how to void properly either. They have to learn which muscles to relax and which muscles to flex over time which explains why they are so frustrated before a poopy diaper.) Their eyesight is limited to a shallow depth of view, their hearing is somewhat muffled, they can't turn their heads or control their limbs. All developmental games at this point are to help them grow into their next set of skills in the key areas. I try to do exercises in each activity group everyday. Social Attachment: Babies learn quickly to form strong emotional bonds with caregivers during this stage of life. Many development exercises in this arena are focused on the primary caregiver exposing Baby to positive new experiences. Infant Massage: After every bath, I spend a few minutes massaging BB while talking to him. Now if I could just talk DH into giving me a massage after every one of my baths. New Experiences: Most days, I try to expose BB to something new. A trip to the grocery store, a walk in the neighborhood, sitting in a different room of the house or from a different perspective while holding him. Dancing with Music: Holding BB close, I dance around with him to my favorite songs. It's some of the little exercise I get while he feels secure. Motor Skills: At this stage, body awareness, strength building and hand eye coordination are the keys to developing the precursors to purposeful movement. Activity Gym: Everyday, BB gets a span of time in his activity gym where he's able to look in a mirror and reach for any number of toys. He swats and has accidentally grabbed a number of toys. Pedaling: While BB is in a good mood, I pedal his legs like he's riding a bicycle. He does this on his own often now and during tummy time he also does this. 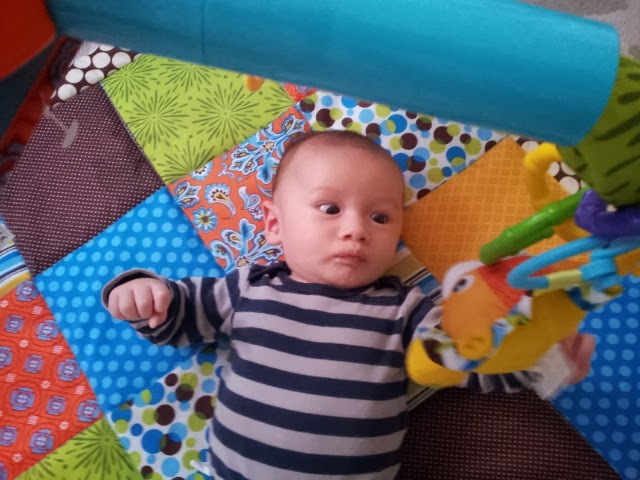 It looks like he's quickly developing the muscle and motion to eventually crawl. Speech: Babies will learn speech typically by learning first and later mimicking sounds. Conversations: While BB is talkative, I respond to him and allow a space between my speech for him to respond. He now waits for me to respond before he starts babbling if we're having a "conversation." Facial Expressions: When BB is being particularly expressive with his face, I do facial expressions and define them. Smile for happy, frown for sad, furrowed brow for confused and so on. He's got the milk drunk face down. Mimicking: Again, while BB is talkative, I mimic his sounds (and sometimes his motions) and he mimics me back. Then I make different sounds to see if he'll try to make the same sound. Problem Solving: Basic stimulation leading to cause and effect builds the foundation for problem solving at this stage. Rattle Play: BB has a variety of rattles that make different sounds. I put them in his hand and shake them so he realizes he's making the sound. Toy Swatting: I hold toys that swing in front of BB so he can hit them. When he hits them, he sees them swing and tries to hit them again. Memory: Like social attachment, exposure to new positive experiences creates a strong foundation for memories. Retelling: After going somewhere new, later in the day, I repeat all the things that we did and saw. This probably does nothing for him actually, but Baby Minds recommends this and I like doing it because it's the closest thing to a conversation I get during the day while I'm on maternity leave. New Items: I expose BB to new items, like an orange or a spoon, and let him feel it, touch it, look at it and smell it. It stimulates all of his senses and it'll be familiar to him as he gets older. Reading Preparation: Though most reading preparation at this stage is accomplished through speech and language development, baby signs can help Baby connect visual signs with sounds. In addition, helping Baby differentiate visual nuances is a skill that can be learned at this age. Compare and Contrast: I haven't done this yet because my mobile hasn't come in, but adding pictures of things that are the same but slightly different, like those spot the difference pictures in the old Highlights magazine (do they still publish that?) allow baby to differentiate shapes. Baby Signs: DH is reading a book on baby signs right now so that when we say basic things like "eat" we can accompany it with signs. This will help him in future reading but also allow him to eventually communicate even before he learns to speak. Math Preparation: Teaching patterns by variation in quantity of actions is the precursor to math and counting at this age. Tickle Tickle: I tickle BB in a pattern. For instance, Tickle, Tickle Tickle, Tickle Tickle Tickle then Tickle, Tickle Tickle, Tickle Tickle Tickle again. Eventually, this is supposed to teach him to interpret patterns which is the precursor to counting. Repetition: When I have multiples of something, I show BB the item and count. Then I repeat a couple of times. I have 4 granny smith apples, so I count them out and put them down and then do it again at least 2 or 3 times. Creativity: Limiting exposure to television is the advice given in this area to prevent a lack of creativity.